“Treat the Clubhouse as your home and above all else, please be courteous to others who share these amenities”. The Clubhouse building and grounds are the centerpiece of Bear Hollow Village. They must be used in a responsible and safe manner at all times by the owners, their guests, and nightly and longer term renters. This Policy Statement will outline the guidelines established for the utilization of this facility to ensure that the Clubhouse continues to be a place of comfort and enjoyment for the residents and visitors to Bear Hollow Village for many years to come. In accordance with Article 3.3 of the Second Amended Restated and Confirmatory Declaration of Protective Covenants, Conditions, and Restrictions for Bear Hollow Village (CCR’s) the Board of Trustees for the Homeowners Association is empowered to promulgate Rules & Regulations for the operation of the Clubhouse and facilities. Clubhouse – refers to the Clubhouse building and all facilities contained therein, the pool and hot tub areas, and all surrounding grounds. Agreement and Acceptance of Policy regarding Clubhouse Rules & Regulations – an Owner, guest or renter accepting custody of a Clubhouse access key card and using the card to gain access to the facility is deemed to indicate their acceptance and adherence to the Policy, Rules & Regulations by utilization of the access key card. The Homeowner’s Association and the Board of Trustees encourage the use and enjoyment of the Clubhouse. Owners are permitted to bring guests into the facility. All persons utilizing the Clubhouse are expected to exhibit good manners and considerations for others at all times. 1. Hours of Operation. Clubhouse hours of operation will be determined by the Board of Trustees and clearly posted in the Clubhouse. Hours of Operation will be determined by the season of the year, availability of the premises, and other factors that may impact on Clubhouse operations. Hours of operation are subject to change from time to time as circumstances dictate. 2. 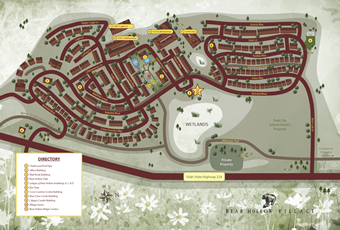 Entry into the Clubhouse will be by an electronic access key card issued to Unit Owners within Bear Hollow Village. Entry must be obtained through utilization of the access card thru one of the access doors / outside gates provided on the premises. 3. Each Unit will be issued one Clubhouse (1) electronic access key card at no expense. electronic access key card at a cost of $100.00. No more than two (2) cards maximum per Unit / Owner will be issued. Unit Owners are responsible for the transfer of their issued electronic access key card(s) to their property manager, agent or renter who will utilize the Clubhouse facilities. Clubhouse facilities without the Owner/s/ being present or by circumventing access privileges in any way will have their access privileges revoked for up to one year. Any Owner having their Clubhouse access privileges revoked or suspended for violation of the Clubhouse Policy, or any other Homeowners Association Policy, will be required to pay a re-instatement fee of $100.00. $50.00 replacement fee that must be paid at the time of the issuance of the new access key card. The card reported lost will become de-activated upon the issuance of a replacement card. 6. The Clubhouse doors and pool gates will remain locked at all times. It is a violation of the Rules & Regulations to hinder the closing of the doors and gates, or to place an object so as to keep the doors and /or gates in the open position. (Under exigent circumstances this Rule will not apply). 8. Individuals under the influence of alcohol or other impairing substance are prohibited from using the Clubhouse. 9. No loud music, noise or offensive actions which inhibit the enjoyment of the premises by others, or which endanger the safety of anyone on the premises will be tolerated at any time. with their owner / handler. 11. Children under the age of 14 must be under the direct supervision of a responsible adult at all times while in the Clubhouse. 12. No ball playing, rollerblading, skateboarding, bicycles, scooters or wheeled riding toys of any kind are permitted within the Clubhouse. 13. The Clubhouse is not available for rent or utilization by the general public at any time. 14. Unit owners may request utilization of the Clubhouse for a Special Event by submitting a Clubhouse Special Events Application to the Board of Trustees. The Application will detail all rules, guidelines and fee’s associated with the Special Events Application and utilization of the premises. The Special Events privileges are extended to Unit Owners only; not to guests or renters. 15. The Clubhouse is monitored by a closed circuit television system at all times. No unauthorized persons may tamper or touch any components of the closed circuit television system at any time. 17. Posting of signs, notices, flyers or other similar materials in the Clubhouse is prohibited without the written permission of the Board of Trustees, or their delegate. 18. No persons will leave any personal belongings overnight anywhere within the Clubhouse or grounds. 19. No littering. All trash must be placed in a trash container. 20. No offensive or pornographic video tapes, CD’s or DVD’s are permitted to be played on the Clubhouse television/s/. 21. Any person who is injured in any way while on the Clubhouse premises must promptly notify the Homeowners Association of the nature of their injury and the circumstances surrounding the injury as soon as possible after the injury occurs. utilizing the Clubhouse must adhere to all verbal directions / requests / orders conveyed to them by the Clubhouse Manager, the Trustees or their designee. 23. At the posted closing time, all persons must leave the premises and ensure that all lights are turned off. The Clubhouse alarm system will be activated one hour after posted closing time. Any attempt to open a Clubhouse door after this time will result in an alarm notification to the Police and Fire Departments. 24. There will be NO LIFEGUARD ON DUTY AT ANY TIME. All persons using the pool and hot tub swim / bathe at their own risk. It is also STRONGLY RECOMMENDED that no one use the pool or hot tub ALONE. 25. All persons utilizing the pool and / or hot tub must wear a bathing suit at all times. 26. Infants or toddlers wearing diapers must also wear a swim diaper to use the pool. 27. Children under the age of five (5) years are prohibited from using the hot tub. 28. Tubes, floats and other similar pool toys are permitted in the pool, but they must not interfere with other persons using the pool at the same time, or they must be removed. 29. Tubes, floats and other similar pool toys are prohibited in the hot tub. 30. No persons using the pool, hot tub or surrounding areas may engage in any unsafe activities, including running or horseplay. 31. No persons utilizing the pool or hot tub are permitted to tamper with, adjust or change the pool and hot tub control valves or other equipment. 32. Use of the pool and / or hot tub is permitted only when the cover has been removed by the Clubhouse manager or their designee. Use of the pool or hot tub before or after the posted Clubhouse opening / closing hours is prohibited. 33. All beverages in the pool and hot tub areas must be in non-breakable containers. 34. No food or drink are permitted while in the pool or hot tub, or within 10 feet of either facility. 35. No clothing, bathing suits, towels or other items are to be left overnight in the pool and hot tub area. 36. Children under the age of 14 must be accompanied and under the direct supervision of a responsible adult at all times while in the pool and hot tub area. 37. All persons utilizing the Exercise Room must be properly attired in sneakers or exercise type footwear, shorts, shirt or blouse, or other appropriate exercise attire. supervision of a responsible adult while in the Exercise Room. wipe their perspiration from the equipment when they are finished exercising. 40. No wearing of wet swimsuits or wet clothing, wet towels or pool toys are permitted in the Clubhouse Lounge or Kitchen Areas. facilities are intended only as a food distribution area. The facilities can not be used for extensive food preparation. All persons utilizing the Kitchen facilities must clean up after they are finished and place all trash in a trash container. 42. No overnight food storage is permitted in the Kitchen facilities. Any food left overnight will be removed and disposed of. 43. All persons utilizing the Bathroom & Changing Areas must adhere to safe and sanitary practices at all times. 44. Changing from bathing or exercise attire to regular attire is permitted ONLY within the Bathroom & Changing Areas. 45. No towels, personal care items, wet clothing or any other items are permitted overnight in the Bathroom & Changing Areas. If you bring it in with you it must leave with you. will result in an appropriate and immediate enforcement action by the Board of Trustees. Unit Owners in Bear Hollow Village are completely responsible for the actions of themselves, their family members, guests and renters utilizing the Clubhouse under access granted by their key card. Enforcement actions by the Board of Trustees will be against the responsible OWNER. The Board of Trustees are empowered and authorized by the CCR’s to assess fines, suspension of Clubhouse access privileges, or any other action deemed appropriate, in their sole discretion, for violations of the Clubhouse Rules & Regulations. Fines, suspensions or other enforcement actions by the Board of Trustees will be commensurate with the type, severity and / or frequency of the violation cited. A Unit Owner in violation of the Homeowner’s Association Delinquent Dues Policy WILL NOT be afforded Clubhouse access privileges until their account is in current standing. A Unit Owner not in compliance with any other Policy enacted by the Homeowners Association, provided that they have received appropriate notice of their non-compliance in writing from the Homeowners Association, will have their Clubhouse access privileges suspended until they are in compliance with the Policy of the Homeowners Association, as notified. The monetary costs of damages or loss of any Clubhouse property, fixtures or facilities will be billed to the Unit Owners dues account associated with the person causing the damages, as indicated by the electronic access key card used by the person to enter the Clubhouse. All such monetary costs billed to a Unit Owner will be considered payable in full immediately upon their posting to the Unit Owners dues account. Unit Owners will have a Complaint Form available to them, upon request, for the purpose of lodging a complaint or allegation of a violation of the Clubhouse Rules & Regulations, or for bringing to the attention of the Board of Trustees any other concern or issue. The Board of Trustees will review all Complaints properly submitted and received, and take remedial or enforcement actions as necessary. while their privilege to do so is suspended will be charged with the criminal offense of TRESPASSING, in accordance with Utah Code statute 76-6-206, and prosecuted by the Board of Trustees to the fullest extent of the law. Any person who accesses, or attempts to access the Clubhouse without permission to do so, or any person who refuses to leave the premises when asked to do so by the Clubhouse Manager, a Trustee, or their designee, will be charged with the criminal offense of TRESPASSING, in accordance with Utah Code 76-6-206, and prosecuted by the Board of Trustees to the fullest extent of the law.